2018 has been a growth story for Singapore’s fintech sector, with more than 400 existing fintech firms and many more being added every year. Singapore is on its way to become one of the world’s largest fintech capitals in the next five years as a connecting bridge between China and India. These countries are fast-growing economies with large population bases; making great opportunities for large local and global players to collaborate and compete. As these economies continue to grow, there will be a greater demand for better and innovative financial services. We have partnered with Networked Trade Platform (NTP); a national trade information management platform, to provide greater accessibility to finance for businesses. This partnership brings together key logistics functions as well as financial elements for players across the trade value chain. Moreover, the availability of our services on the NTP will supplement financing for importers and exporters by helping them unlock cash flow from their receivables. We were also proud recipients of a certificate of appreciation from Customs Singapore to acknowledge our early support as a pioneer Value Added Service (VAS) provider on the NTP. Also, we are very excited to have kicked off our new partnership and integration with Xero, one of the fastest growing cloud accounting software providers. We were first announced as the pioneering invoice finance app partner on the Xero Marketplace in Singapore by their Regional Director – Asia, Mr Kevin Fitzgerald during the Xero Asia Roadshow in November 2018. Finance application processes are streamlined, offering SMEs the flexibility to draw down funds when needed; in just 3 simple steps – Import, Select and Receive. This integration gives them the tools to easily apply for and improve cash flow. Hence, allowing greater access to funds tied-up in unpaid invoices. The automation of safe data transferring for assessment decisioning and funding requests also cuts down administrative work. Not only is financing made simpler, all accounting ledger entries are recorded automatically, allowing business owners to save time and focus on growing their business. In conclusion, we have created an automated financing pathway that ultimately puts more money directly into the hands of small businesses. With the team we have built and our partners, we are making strides in achieving our goal of making access to finance easier for businesses. Through our work with NTP and XERO, we continue to build on our reputation as a trusted partner to our valued SMEs and Investors clients. Moving forward, we will also be integrating with more cloud accounting softwares and platforms – stay tuned. 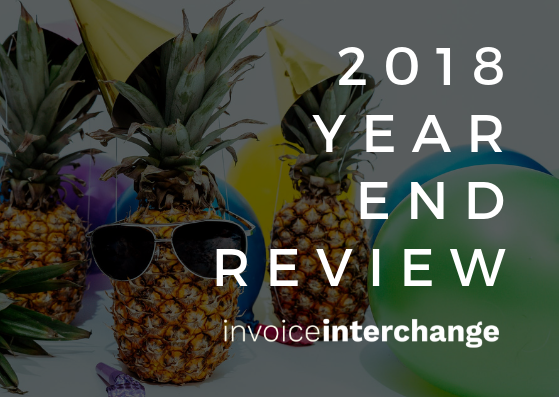 InvoiceInterchange would like to take this opportunity to sincerely thankyou. To supporters like you, 2018 was a very successful year; and we want 2019 to be even more successful for us and for you. On behalf of the team at InvoiceInterchange, I thank you for your engagement and business.